It is day 1001 and the World-9 server is in the Fourth Age. House 10 is generating 153,333 glory per day and at this rate the current Glory round will finish on 17 JAN 2017. My estimate is that the 4th age will be completed on 13 Aug 2017. There are 36 players with the maximum (40) villages and another 51 players with village counts in the 30-39 range. It is day 1029 and the World-9 server is in the Fourth Age. House 10 is holding steady at 153,285 glory per day and at this rate the current Glory round will finish on 12 FEB 2017. The last Glory round took 26 days to complete. My estimate remains that the 4th age will be completed on 13 Aug 2017. There are 1,358 total players, up 152 from 1,206. There are 681 players with a single village, which is more than half the server. There are 677 players with 2+ villages, down 3 from 680. There are 494 players with 5+ villages, up 2 from 492. There are 41 players with the maximum (40) villages and another 48 players with village counts in the 30-39 range. 89 players have 30+ villages which is 6.5% of the server. It is day 1070 and the World-9 server is in the Fourth Age. House 10 is holding steady at 154,462 glory per day and at this rate the current Glory round will finish on 09 MAR 2017. The last Glory round took 26 days to complete. My estimate remains that the 4th age will be completed on 12 Aug 2017. There are 1,298 total players, down 60 from 1,358. All of the server counts are down now that we are past the Christmas gift stash event. There are 614 players with a single village, which is down to 47.3% the server. There are 684 players with 2+ villages, up 7 from 677. 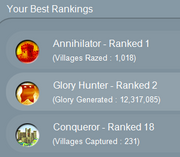 There are 499 players with 5+ villages, up 5 from 494. There are 38 players with the maximum (40) villages and another 52 players with village counts in the 30-39 range. 90 players have 30+ villages which is 6.9% of the server. It is day 1157 on the UK-9 server is still in the 4th age. The last Glory round took 26 days to complete and House 10 still needs to eliminate two more houses. House 10 is gaining Glory at the rate of 156,593 per day which means that this Glory round will end in 20 days on 21 JUN 2017 and the 4th age will end in 77 days on 06 SEP 2017. There are 1,297 total players (down just 1 from 1,298). 606 players have a single village which is 46% of the server. There are 691 players with 2+ villages (up 7 from 684). There are 492 players with 5+ villages (down 7 from 499). 40 players have the maximum (40) villages and another 54 players have between 30-39 villages. 94 players with 30+ villages is 7.2% of the server. I don't claim to be a math expert Deke, but between your first post which estimated August 12, and now this post which estimated Sep 06. That's a pretty big jump considering we've only gained more glory per day then we had in the first estimate. How did you get September 6? There was a pull down error on my Excel Spreadsheet. There are 2 more glory rounds this age, enough to eliminate houses 19 and 14. This Glory round is projected to end in 17 days on 29 JUN 20-17 and the age is projected to end in 17+26=43 days on 25 JUL 2017.